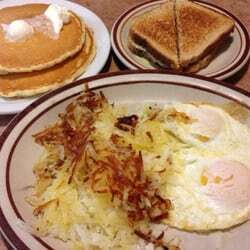 Denny’s has served breakfast all day since the restaurant was founded in 1953. Because breakfast is served around the clock, Denny's says it is the highest-selling category during every hour of the day, including off-peak times. "Many popular dishes, such as our signature Grand Slam are in demand at breakfast, lunch, dinner and late night, so it’s only natural that we’d provide it 24/7," says John Dillon, Denny’s Chief Marketing Officer. In October, the restaurant will be introducing its popular holiday menu including all new breakfast items such as Pumpkin Pecan Pie Pancakes.